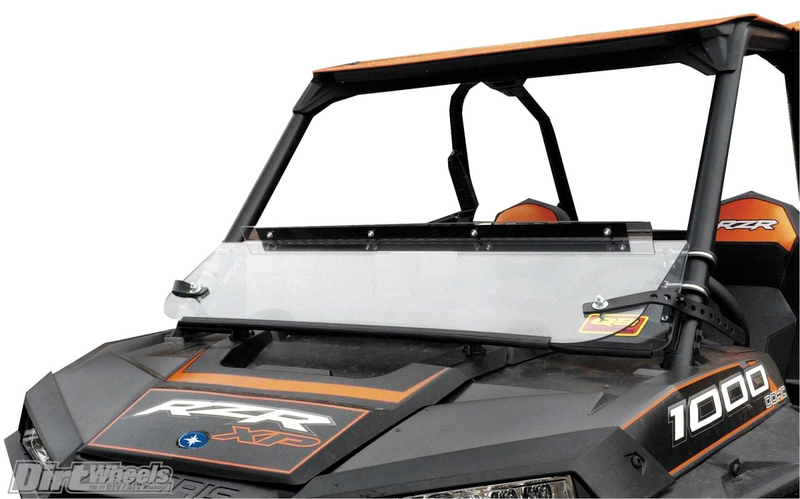 We believe that having a windshield on a UTV is a great thing. Number one, it keeps the elements off you and your passenger when traversing cold, wet or windy days. A windshield can also benefit you in the summer by keeping the bugs off our beautiful faces or preventing nasty windburn! Whether you’re looking for a full windshield, half windshield, folding windshield or a windshield with a wiper kit, you’ll be sure to find something that works for you in this buyer’s guide! Cabela’s versatile UTV folding windshields deliver the ideal blend of flexibility, functionality and style. Once mounted, the durable, weather-resistant nylon hinges can be raised or lowered without tools. Rubber-coated stainless steel clamps mount the windshield directly to the roll cage for solid, vibration-free performance. Gasket trim seals the windshield to the hood and protects the hood from damage. They also offer a half-windshield option. This windshield is made from an ultra-clear window material framed with heavy-duty ProtekX Extreme fabric that instantly shields against wind and rain. 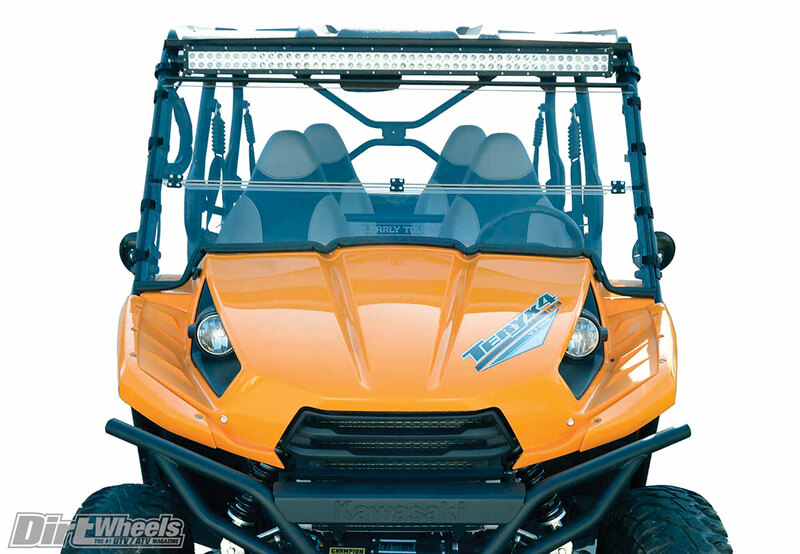 It attaches in seconds to the roll cage of UTVs with cinch-tight straps and rip-and-grip closure tabs. A two-year warranty is included, and it rolls up for easy storage. Clearly Tough’s full folding windshield requires no tools for installation with their easy-strap mounting system. Their scratch resistant, hard coated polycarbonate system can be installed and taken off in a matter of minutes. The top half of the windshield folds down for superior airflow on hot days. They also offer a half windshield option. This hard-coated windshield adjusts to four positions: open, closed and two vented positions. Gas struts hold it open for hunting and while driving less than 5 mph, such as around the campsite. This windshield runs all the way to the top just under your stock visor, keeping out cold air. This is great option when running with a canvas cab or in the winter if you have a heater. EMP also sells standard full windshields and half windshields. Kolpin’s full tilting windshield is designed with a three-position tilt mechanism that permits airflow into the driver compartment if desired. It opens from 3 inches to 5.5 inches and is made from a hard-coated, 1/4-inch, abrasion-resistant polycarbonate. It’s easy to install, and the top windshield section is removable without tools. Open positions are designed for low-speed riding only. They also offer full windshields and half windshields. National Cycle’s Wash‘N’Wipe Quantum hard-coated polycarbonate full windshield is made for all elements. 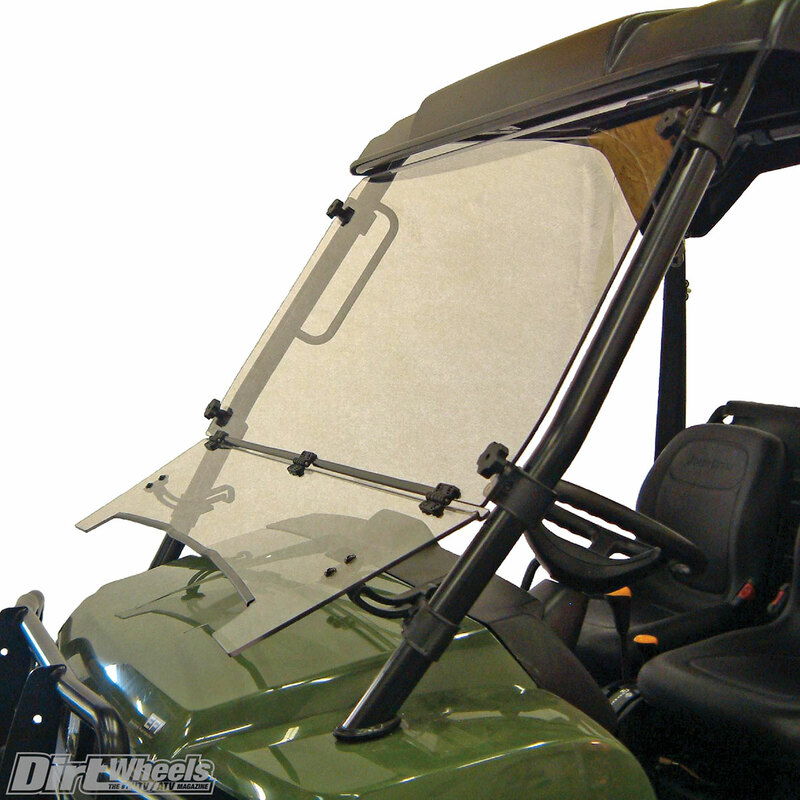 Wash’N’Wipe UTV windshields are packaged with complete mounting hardware. The washer/wiper unit comes pre-installed. The fluid reservoir, fluid switch and electrical wiring harness come with detailed installation instructions. The Quantum polycarbonate has a three-year warranty. They also offer half windshields and full standard windshields. 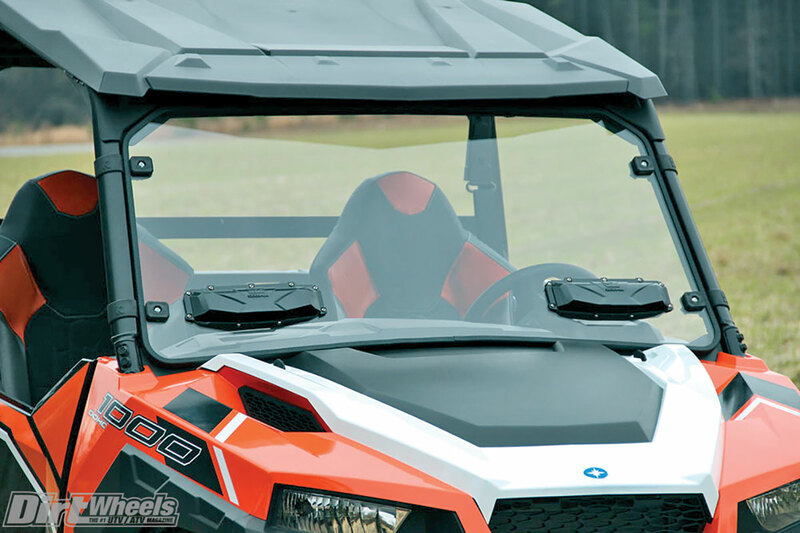 QuadBoss’ folding windshield provides full coverage or it folds down to create a half windshield and more airflow to the occupants. The hinge system allows it to fold up or down easily. Its tool-less design allows for quick mounting or unmounting, and the mounts are made from a rubber-coated stainless steel. The windshield itself is made from a 0.177-inch-thick polycarbonate material. Quadboss also offers a half windshield option. The airflow from the Bug Buster windscreen not only keeps you cool but helps carry dust out of the cab. The UV-resistant, high-strength mesh material provides optimal clarity and won’t scratch, giving you a clear view. While not all mud is created equal, most mud is easily deflected with only small remnants left behind that are easily removed with a simple “flick” of the screen. Other options include rear windscreens and a roof windscreen. This windshield has a laminated safety-glass panel that’s robust enough to avoid scratching or deformation. This windshield folds forward, out of your way, on pleasant days and onto the hood where it rests securely on shock-absorbent brackets. 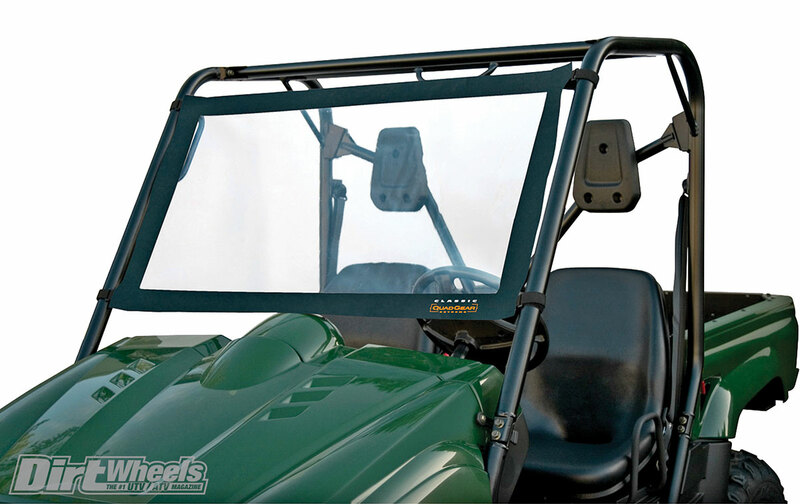 Whether up or down, the windshield is secured by included T-handle fasteners. A convenient full-width lower vent aids ventilation. 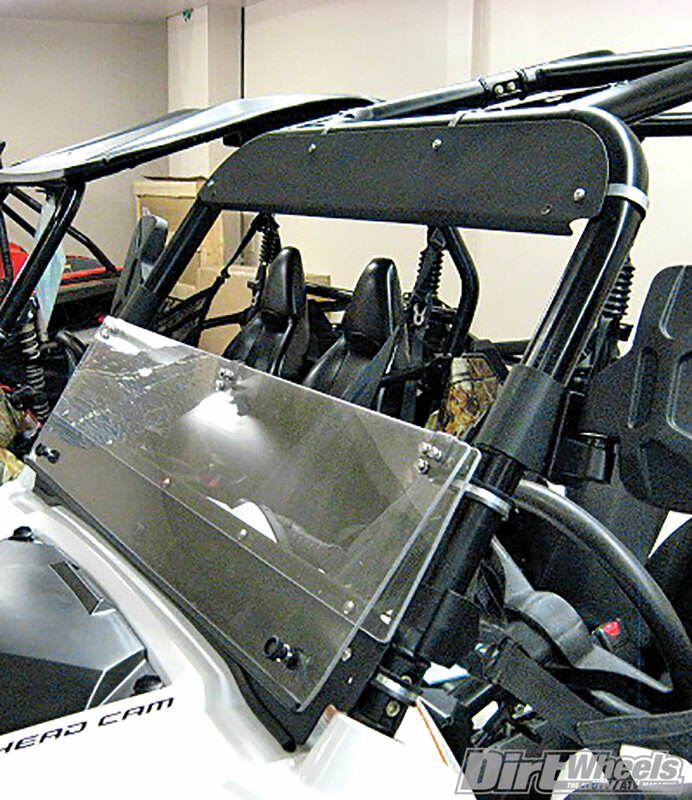 The windshield is held in a tough metal housing designed for easy installation on your UTV. They also offer vented full windshields. Seizmik’s full-vented windshield is available in 0.220-inch, optically clear, double-hard-coated polycarbonate. Its custom-designed, strong, low-profile nylon clamps do not interfere with other accessories. With its easy-turn knobs, it requires no tools for install or removal. Innovative windshield vents help on those hot days, and a gasket helps with keeping water out. They also offer full windshields, flip windshields and half windshields. 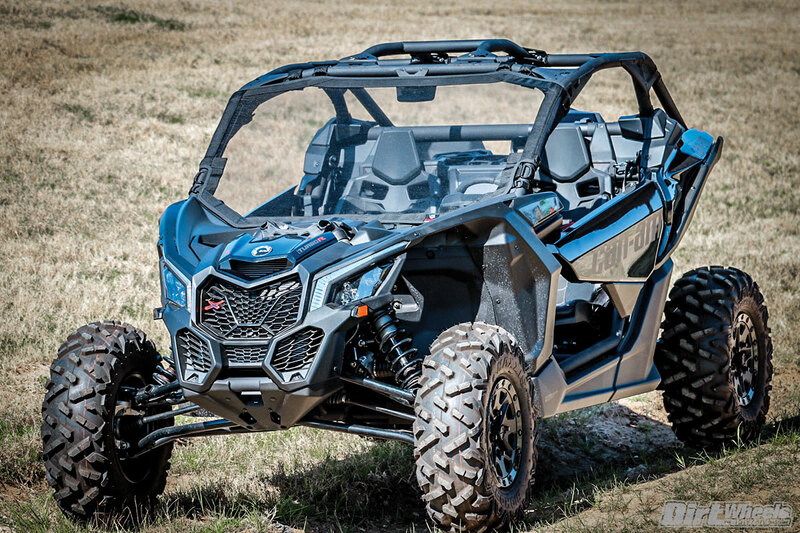 With many protection and tint options to choose from, each SuperATV windshield is super-tough, abrasion-resistant, Makrolon-coated polycarbonate with a bottom seal that’s contoured to your ride’s design. 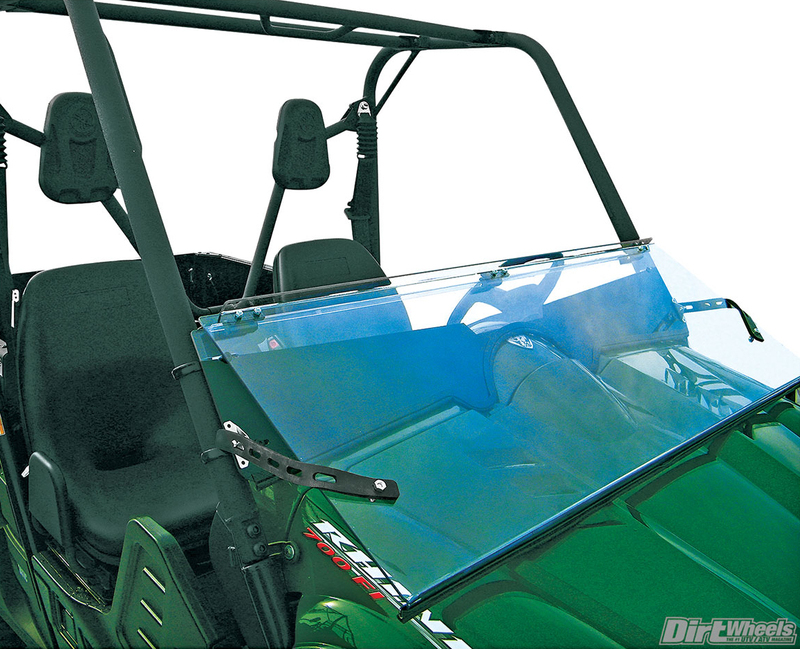 The 1/4-inch Makrolon is much stronger than your average UTV windshield. 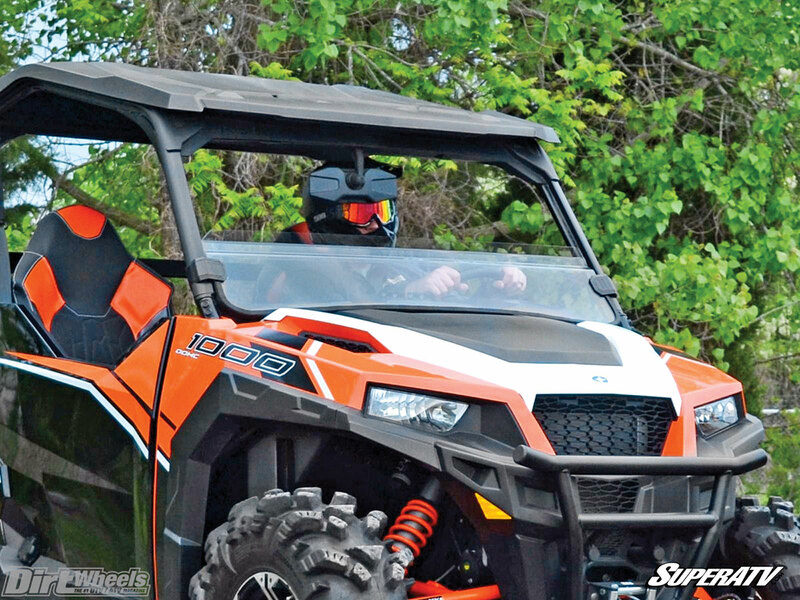 SuperATV offers a one-year warranty on all their windshields. They also offer non-scratch-resistant or scratch-resistant half/full windshields, vented windshields, rear windshields and flip-up full windshields. 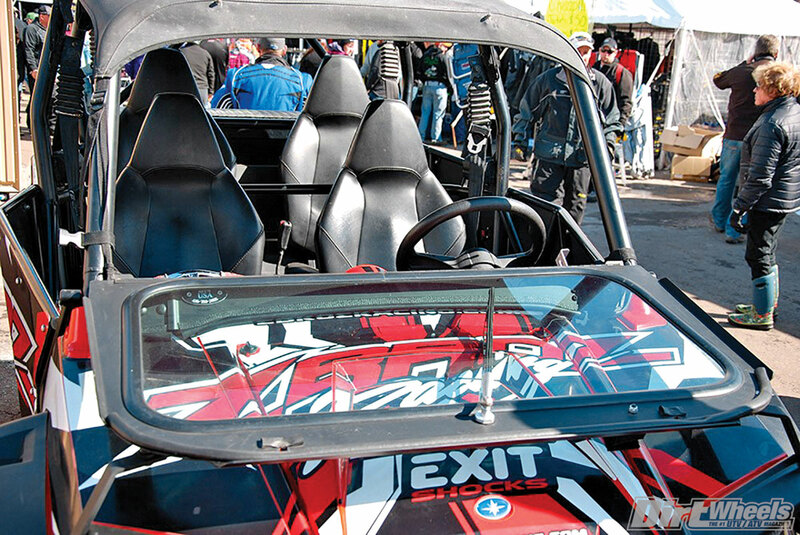 Slasher Performance’s folding reinforced windshield is made of durable, UV-resistant polycarbonate (Lexan). It opens for visibility when dirty or for ventilation in hot weather. Rubber bumpers protect the sections from damage when folded. Plastic knobs lock the windshield to the sun visor in the closed position or to the bottom aluminum frame when open. When open, the aluminum sun visor stays in place and helps shade the occupant’s eyes. 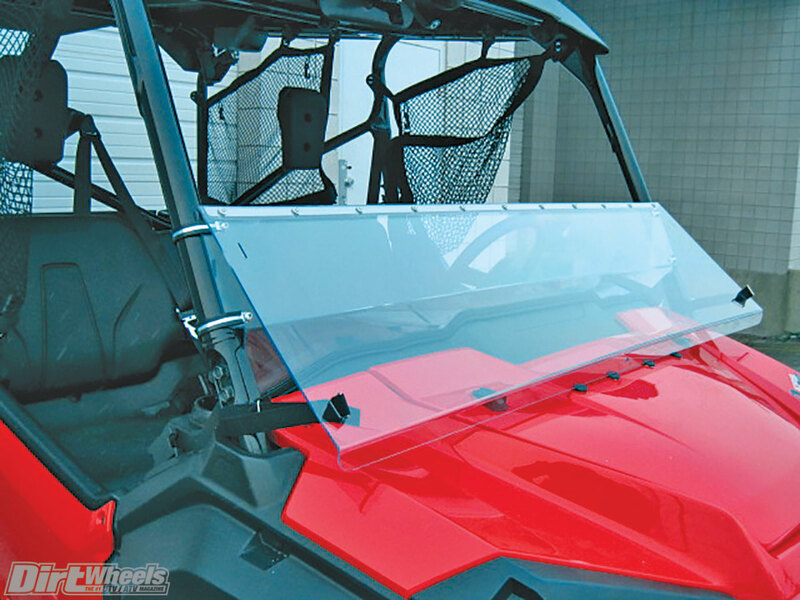 Tusk’s polycarbonate UTV hinged half windshield is a great option for your UTV. 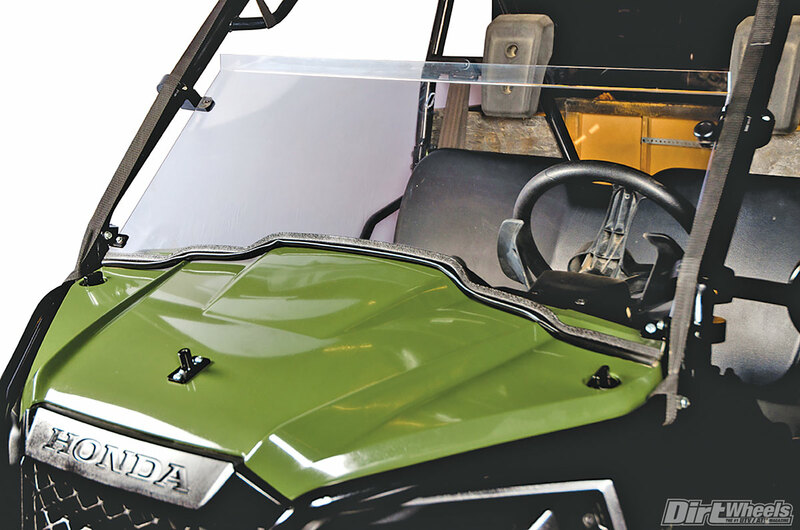 This folding UTV windshield gives you the best of both worlds. You can have the hinged windshield in the up position to keep most of the wind and elements away, or put the windshield down for unrestricted vision and maximum airflow. It’s 2 inches taller than the standard Tusk half windshield. They also offer full windshields, folding windshields and standard half windshields.